You want me to show this to the cat, and have the cat tell you what it is? ‘Cause the cat’s going to get it. Several years back, I bought three tiny catmint plants. These were Nepeta faassenii “Walker’s Low”. They were small and sweet and I found it hard to believe that they would grow to be the billowing waves of purple spires shown on the plant tag. But they did! And they’ve spread and been divided and helped populate the entire garden. 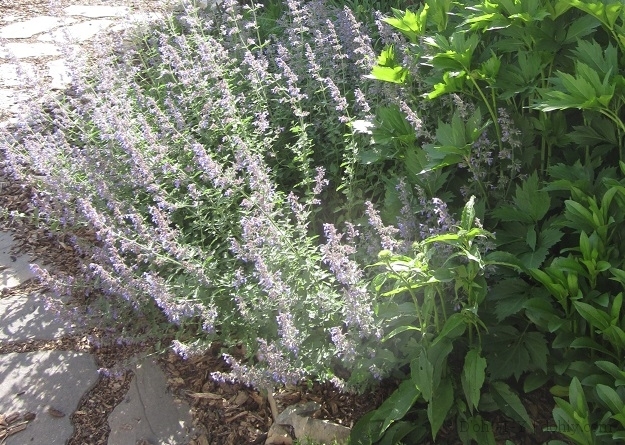 Nepeta is an excellent substitute for lavender, with its mounds of silvery green foliage and spikes of purple flowers. I have all sorts of trouble with lavender in zone 4, but nepeta is no bother at all. Actually, why do I keep trying to grow lavender? Catmint (Nepeta faassenii) is related to catnip (Nepeta cataria), and cats find it nearly as irresistible. The nephews love to bring sprigs to our indoor cats. Mayya and Inigo both go from zero to intensely freaky in under 20 seconds. Then it’s all diluted pupils, zigzag chases and curly tails. Like Gaillardia, catmint draws the bees and butterflies. It’s lovely spilling out over the border or the edge of a wall with a full host of pollinators. 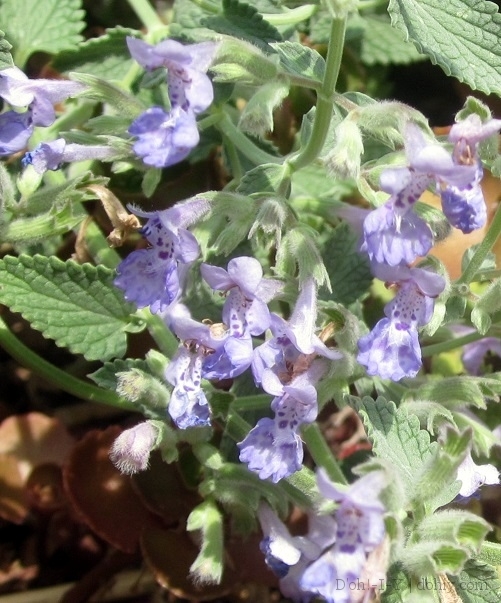 Nepeta gives off a nice, light fragrance when you brush by (just ask the cats!). It mounds up and can be left to spread or given a haircut — it’s happy either way. Ready to drive cats wild in zones 4 through 9 (US and world zone maps). Vigorous grower that spreads well, but not invasively. Low water needs once established. Repeat bloomer, even if you don’t trim it back — better if you do. Only when I took this photo did I notice that each flower is like a tiny orchid. Catmint plays well with others, gets cats stoned and requires little care. It’s a triple threat! 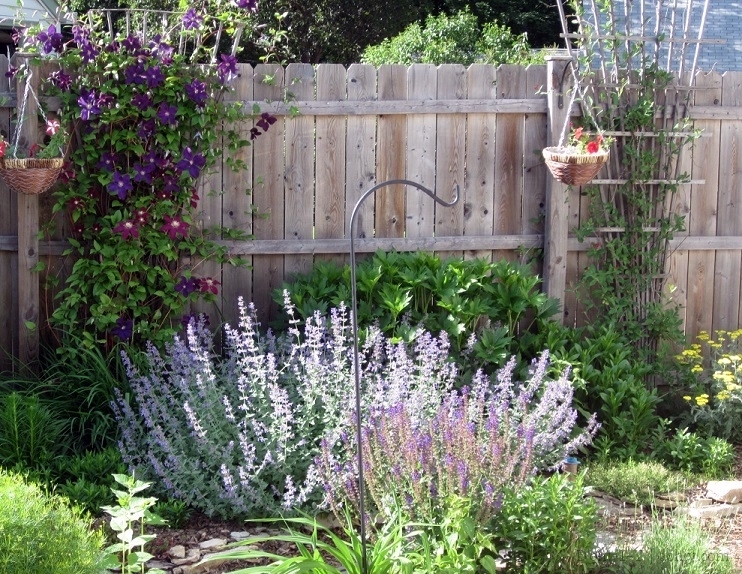 If you have trouble with lavender — or even if you don’t — try a little catmint. Want more good easy plants? Check out Gaillardia, Clematis and Weigela. 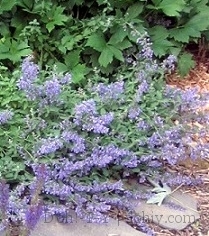 This entry was posted in Yard & Garden and tagged catmint, easy-to-grow plants, lavender substitute, nepeta, walker's low. Bookmark the permalink. My cat loves catmint and he goes crazy with it! That’s smart, keeping it in two pots! Our cats are indoor cats, so I have to bring the catmint to them.